Promises made by the Chief Minister include housing for all within 10 years, robust law and order, 85% reservation in Delhi government jobs and colleges for local youth, and an immediate end to the sealing drive. 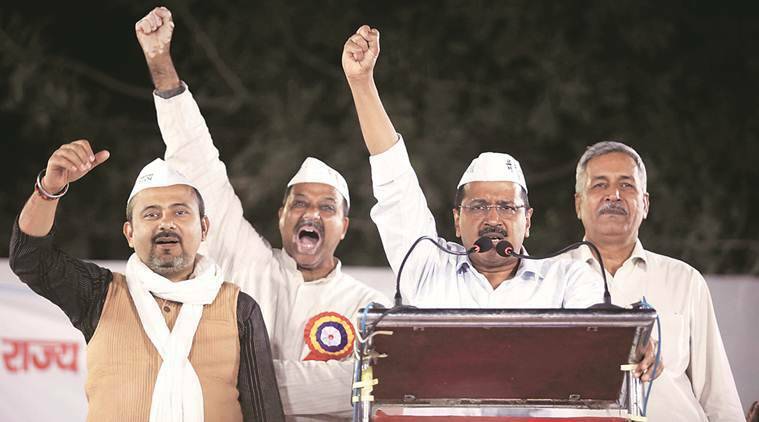 “Ladna padega, marna padega, katna padega.” Launching the AAP’s campaign for the 2019 Lok Sabha polls, Delhi Chief Minister Arvind Kejriwal Saturday sought to remind people that the path for full statehood, the party’s primary election plank, was paved with thorns. He urged people “not to elect a Prime Minister” but to vote for statehood in the upcoming Lok Sabha polls. Addressing a public meeting in Timarpur, he hit out at both the BJP and the Congress for “reneging” on the promise to grant statehood to Delhi. “You won’t get statehood easily. You will have to fight. The people of Uttarakhand, Jharkhand, Telangana had to fight for statehood. Ladna padega, marna padega, katna padega. Sabse pehle main ladunga, main marunga, main katunga inse. Are you people ready? This time, vote for full statehood,” he said. He devoted much of his speech recounting the development work carried out by the AAP government since taking office in 2015. He said that through work in the fields of education, health and power, “maine Delhi ke har aadmi ka seena 59 inch kar diya” — in a jibe at the “56-inch chest” rhetoric. However, all of it came with a rider that the AAP can work properly only if Delhi is granted the status of a full state. “Padha likha aadmi hoon, farzi degree nahi hai mere paas. I have come after doing all calculations,” he said at one point. Attacking the Prime Minister, Kejriwal said it does not “behove him to harass” a state government. “The kind of trouble that we had to face is unprecedented. Their only aim was to stop Kejriwal from working. I worked so much for you, fought every day… don’t vote for Modi ji unless you want to see me fasting again,” he said.